Media captionThe father of two boys on launching a Playmobil pirate ship that sailed to Norway. 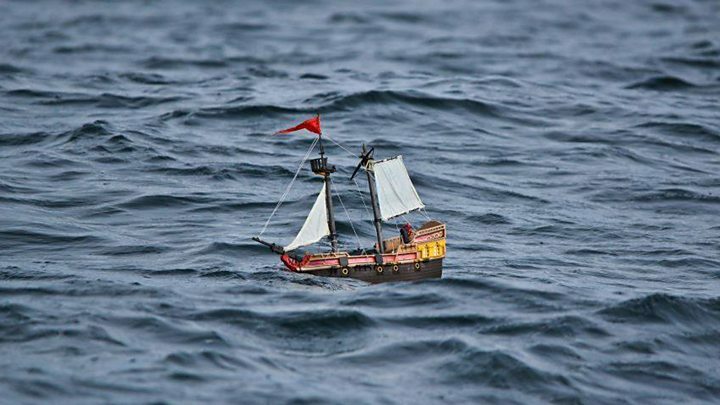 A toy pirate ship launched by two young brothers in Aberdeenshire has sailed the high seas to Scandinavia. Ollie Ferguson, eight, and Harry, five, from Turriff, first launched their Playmobil ship from Peterhead at the end of May. It sailed hundreds of miles to Denmark, where a family sent it on its way. It then made it to Sweden and Norway. The boys launched the pirate ship as part of a bucket list of adventures they have put together. The ship, named Adventure, needed some adaptations before it was ready to tackle the North Sea. A counterweight was added to help it stay upright and it was filled it with polystyrene to help it stay afloat. After trials in a swimming pool, they took it to the coast and launched it into the waves. It carries a message asking anyone who finds the boat to launch Adventure back into the sea. Their father, MacNeill Ferguson, said: "Everyone that has picked it up has been really kind and sent us photos and looked after it. "People are really getting into the spirit of it. "The boys have enjoyed it and every time we get a message telling us where it has landed we get on the computer and work out where it went, so they are tracking its progress on the map and it gives them an understanding of how big the world is." He continued: "I was concerned that the currents along the coast would take it down the north east coast of Scotland, so I was over the moon when it made a beeline for Scandinavia. "It reached Denmark and then Sweden, where it was picked up by a lady who was sailing her own boat and found it in a tree. She was really kind and remade the sails for it. "Then it was picked up by a Norwegian conservation vessel." The story attracted interest in the Norwegian media, and Adventure is now being taken aboard the Christian Radich, a Norwegian full-rigged ship. It will carry the vessel down to Cape Verde and then launch it, giving it the chance to sail across the Atlantic.